This page last revised November 28, 2015. Receive an incredible 65% discount on new web hosting orders. Use coupon code SMB2015 during checkout. Saturday, November 28th 12:00AM CST thru 11:59PM CST ONLY. 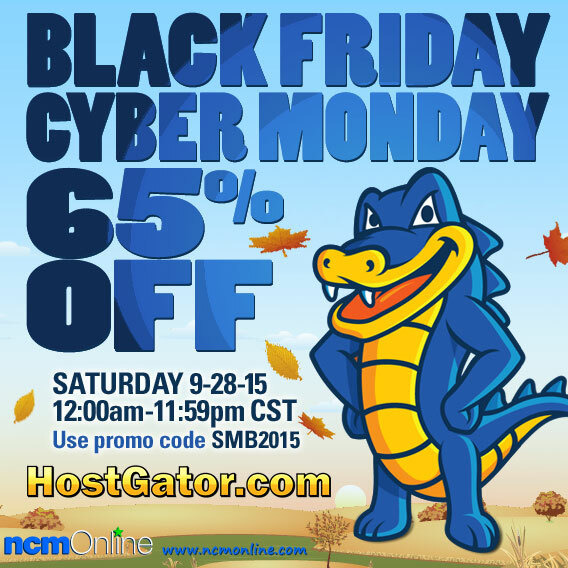 Take advantage of HostGator’ 65% Off Black Friday Cyber Monday 2015 Promo Code, but remember, the sale lasts only 24 hours starting at 12 AM CST on SATURDAY, November 28th. This discount will not be extended, so get to HostGator.com now to save big! Discounted pricing valid for initial term only; all plans renew at regular rate. Offer ends 11/28/2015 at 11:59PM CST.